What is a football penalty? Football penalties are determined by a crew of six officials, called referees. These men wear distinctive black and white striped shirts, white pants and white ball caps. A head referee wear a black ball cap. All of these men carry whistles with which they can stop the play at any time by "blowing it dead". The head referee carries a stop watch, which he uses to keep track of the official time. The officials each carry a yellow flag in the back pocket. 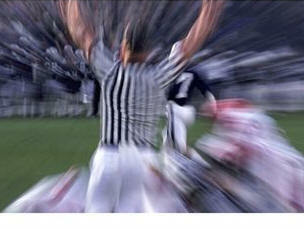 When an official sees a penalty occur, that official throws his flag to indicate a penalty. Officials also carry a bean bag. If an official sees a second penalty occur, that official either throws his bean bag or his cap. Bean bags are often used to spot the ball, for the sake of measurements. This is often used to mark where a ball landed on a kick. 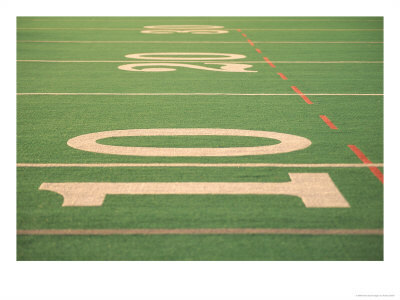 Penalties in American football are enforced by marking off yardage, usually between five and fifteen yards per penalty. Less serious penalties call for a five yard penalty. Intermediate rules violations tend to count as ten yards. The most serious violations, typically those which involve danger to another player or are otherwise against the "spirit of the game", count for fifteen yards. Certain penalties in football might call for more or less than the standard 5 to 15 yard penalties. Here are a few of them. Interference happens when, before the ball arrives, a player deliberately makes contact with an opponent beyond five yards of the line of scrimmage, keeping that opponent from catching the ball. There can be both offensive and defensive interference, though defensive interference is called more often. If the ball is deemed uncatchable, interference is not called. If a defender tips the ball on its flight to the receiver, then players may make contact with one another without interference being called. There is also a rule called "incidental contact", where two players’ legs get tangled, but neither player is technically to blame for the entanglement. In this case, no penalty is called. 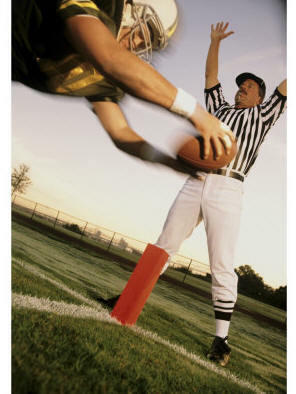 Interference penalties in the NFL are placed from the spot of the foul, so that the yardage might cover 40 or 50 yards. Though this might seem harsh, it is meant to compensate for the potential lost yardage of a long pass play. In college football, for example, all interference penalties are worth five yards. So it is a smart play for a defender who is about to get beat for a sixty yard touchdown to simply tackle his opponent, taking the five yard penalty instead of giving up the touchdown. The severe NFL rules is meant to eliminate this kind of tactic. When a penalized team is near its own goal line and the penalty yardage is more than half of the distance to that goal line, then the yardage assessed is half the distance to the goal line. Therefore, if a player commits a penalty (normally) worth five yards, but the penalty takes place on his 4 yard line, the penalty yardage assessed is two yards. Sometimes, but not always, these penalties are an automatic first down. If a kickoff is kicked out of bounds, then the receiving team gets the ball on their 40 yard line automatically. Intentional grounding happens when a quarterback get rid of the ball in order to avoid a sack. The play is whistled dead (ended) and a penalty is assessed from the spot of the foul. Also, the offense loses a down. Below is a list of the most common penalties in football. When an offensive player already set for the snap moves or flinches before the snap of the ball, this is called a false start. It is more commonly known as offsides. The play is over and a five yard penalty is assessed. Offensive skill position players can move parallel to the line of scrimmage before the snap of the ball. One at a time can move perpendicular to the line before the ball is snapped. These players must be set for one second before the snap. If a player moves without setting properly before the snap of the ball, or if that player is moving perpendicular to the line of scrimmage when the ball is snapped, then an illegal procedure penalty is called. This is a five yard penalty. When a defensive player moves across the line of scrimmage and does not return to his side of the ball before the snap, this is called encroachment. If a defensive player crosses the line of scrimmage and this causes a set offensive player to move, this is also considered encroachment. This is a five yard penalty on the defense, with a replay of the down. The offense can decline this penalty, if the gain on the play is more advantageous. When an offensive player grabs part of the jersey of a defensive player, then offensive holding is called. Also, if an offensive player grabs the arms of a defender (or does not keep his arms inside the arms of the defender), or if the offensive player wraps an arm around a defender, then offensive holding is called. This is a ten yard penalty, with the down being replayed. Defensive holding can also occur. If this happens, then it is a five yard penalty and an automatic first down. If an offensive player is engaged in a block of a defender, then another offensive player blocks the same defender below the waist, this is called a chop block. A fifteen yard penalty is assessed against the offense. The chop block is considered a particularly dirty play, because defenders view it as a deliberate attempt to cause them a knee injury. More than one fight has started over perceived chop blocks. When an offensive player blocks a defender from behind, an illegal block in the back occurs. A ten yard penalty is assessed. There is a gray area with these blocks, because some blocks from the side also are called. Typically, if a player blocks another player outside of the front shoulder pads, it is possible for an illegal block in the back to be called. A block below the waist from behind is called clipping. This is a fifteen yard penalty, because it is deemed more likely to cause an injury. Clipping and illegal blocks in the back happen most often on kickoffs and punts. In the pro game, there is a 45 second clock between plays. 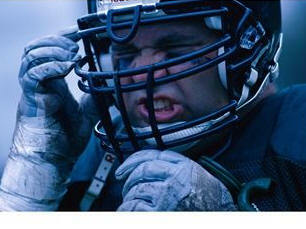 Therefore, if the offense does not snap the ball before the 45 seconds are up, then a delay of game penalty is called. This is a five yard penalty. When one player grabs the face mask of an opponent, this is a five yard penalty. When a player grabs the face mask of an opponent and uses it to tackle or otherwise manhandle that opponent, a fifteen yard penalty is assessed. This is similar to pass interference, though the penalty assessed is only five yards and an automatic first down. This is when a defender makes contact with a receiver like in pass interference, but before the football is in the air. On a punt, if a player from the receiving team runs into the kicker while his leg is still in the air, then a running into the kicker penalty is called. This is a five yard penalty. If that player is pushed into the punter by one of the punter’s teammates, then no penalty is called. Also, if the offending player gets his hand on the ball, no penalty is called. Also, if the balls hits the ground before the punter catches it to punt it, no penalty is called. If a player who runs into the punter is deemed to be deliberately running into the kicker, a "roughing the kicker" penalty is called. This is a fifteen yard penalty and an automatic first down. If one player strikes an opponent with a fist or kick, runs into a player after the whistle is blown, or jumps on the pile after the whistle is blown, then a player is called for an unsportsmanlike conduct penalty. If a player taunts an opponent by spiking the ball in his face, or some other flagrant act, then an unsportsmanlike conduct penalty is called. These penalties are worth fifteen yards. In recent years, illegal celebration penalties have become more stringent. When a player scores a touchdown, that player cannot involve other players in a choreographed celebration, use a prop for his celebration or fall to the ground in a celebration. If teammates leave the bench area to celebrate, this is illegal, too. If any of these happen, then an unsportsmanlike conduct penalty is called. Though the touchdown still stands, a fifteen yard penalty is assessed on the following kickoff. Due to perceived pivotal bad calls by the referees over the years, a new rule was written called the instant replay rule. In the NFL, the head referee can look at a replay camera on the sideline, to view all the camera angles and see whether a call should be overruled. Not all plays can be overruled, especially those which have been whistled dead or those which involve "judgment calls", like pass interference. There are rules which stipulate when replays are used. In the NFL, the head coaches are given a red flag. When the coach wants a play reviewed, that coach may throw his flag onto the field and ask for a review. This is called a challenge. To overturn a call, a referee must see indisputable proof that the call was wrong. Most calls are not overturned and in many cases (to the frustration of coaches, players and fans alike) this is the reason given. Each coach has two reviews per half. If a challenge is not upheld, then the coach loses a timeout. Since there are only three timeouts per half, and these are the only way a defense can stop the clock late in the game, timeouts are considered precious. If a coach uses both of his timeouts in a half and both are upheld, he is given a third challenge for that half. Challenges do not carry over to the next half. Under two minutes of either half, a coach is not allowed to challenge a call. In this case, officials in a replay booth above the field may call for a challenge, whereupon the same process is used.